Monday; wow, what a long day! Started working 4:45am and kept on going until 3pm, when I logged out. I wanted a quick ski-trip before taking on the 3,5 hour drive from Sogndal to home on Gurskøya, and the choice fell on Nuken. Overcast, but nice weather. I drove up to Åberge (260m) and could (of course) ski directly from the car. It had been snowing half the day, and I was curious about having to break trail or if someone had already been to the top. Breaking trail would mean a seriously hard ascent for Karma. Fortunately, someone HAD already been to the top and Karma only had to seriously struggle in the upper part of the forest. The descent was not legendary, as I had to wait a lot for Karma. She can run fast, but not in deep snow. The forest road from Hølsete to Åberge could have been fun, if it hadn’t been for the tractor that had been up here earlier in the day. The trip: 9km, 660 vertical meters. 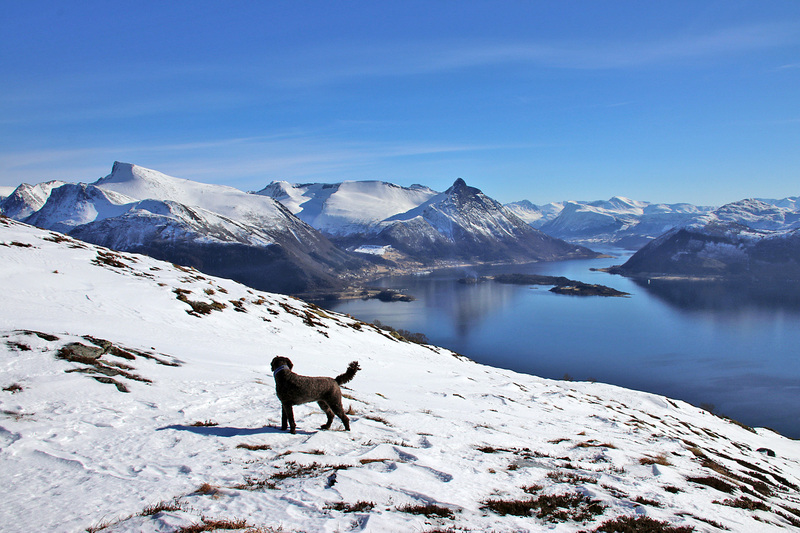 Tuesday; after working in the Ålesund office, I got in my car, having absolute no idea about where to go for a trip. 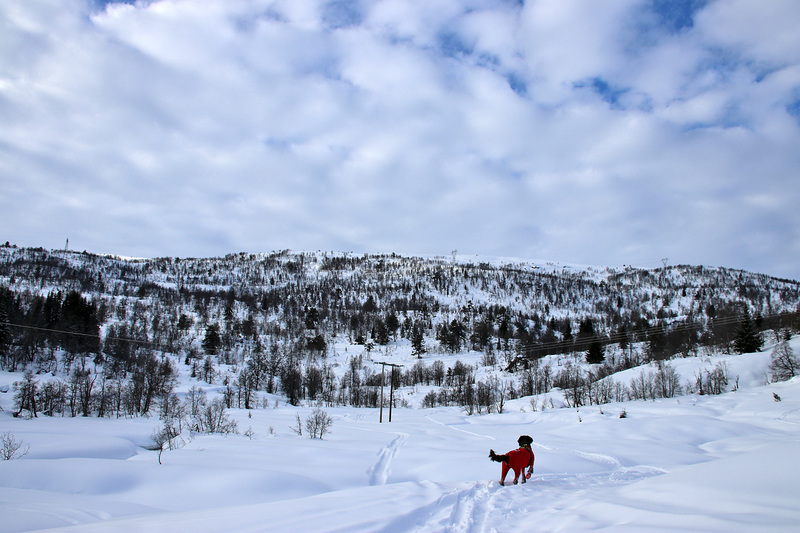 I had asked my friend Trond for some options, and one of the mountains he mentioned was Otrefjellet above Vatne. He said there were tracks (foot) up the mountain, and hopefully, they would carry Karma’s weight. Finally at Bakkegjerdet, and I concluded (to my delight) that I could ski from the car. A few minutes earlier, I could have bet money on the opposite. The road to lake Ulvestadvatnet was a transport leg, and I could see the tracks up the mountain from a long distance. After a while, I got to the place which have led to the “Mt. Horror” subtitle in the below video clip. The “Jaws from hell” is really an astonishing place. Falling into here can lead to serious injure (or worse). It’s not actually the “Jaws” that is the biggest problem, as I can’t imagine there would be so much snow that a first time visitor won’t see that there is something special going on here. But it’s the numerous other holes in the ground that is the true danger. We were fortunate to not fall into anyone, but it was close. And in retrospect, I regret taking the dog up here. But still… FUN! The trip: 8,2km, 510 vertical meters. 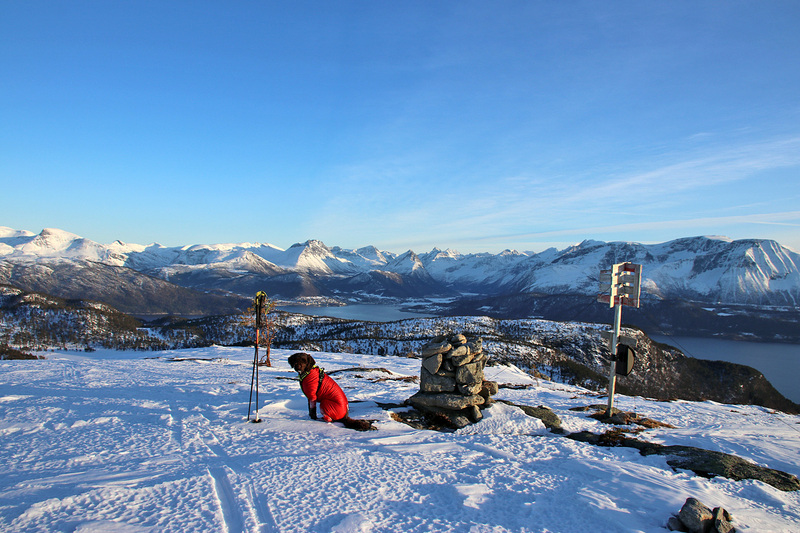 Wednesday; when looking at Ulsteinvik and Hareidlandet island from where I live, skiing is the last word that comes to mind. Unless you plan on carrying the skis up for a long time. But it helps to know the shadow valleys. Ulsteindalen being one of them. Of course, there was no snow at the trailhead (110m), but I only carried the skis for 5 minutes before I could put them on! OK, a bit icy in the beginning, but a few minutes later – proper snow! From Litlevatnet, I followed old tracks up to and across Sarshornet. 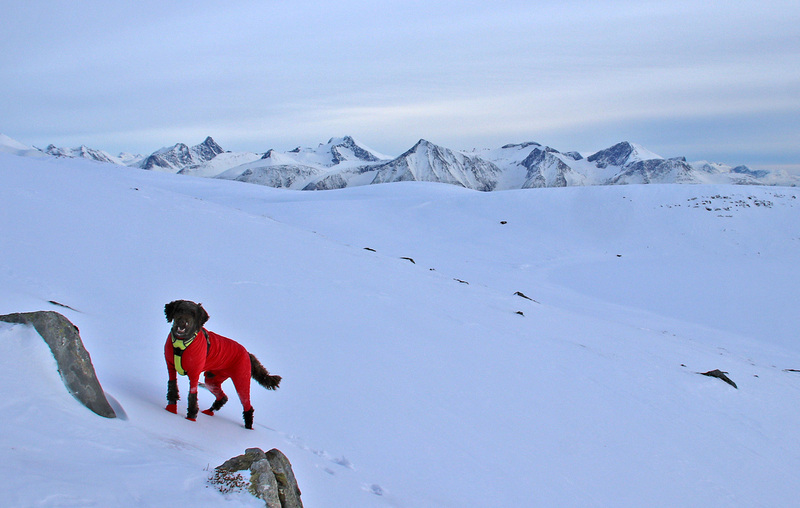 The final ascent to Storebroren (Big Brother) included a few zig-zags, as I had to find good snow for Karma. With her socks, she stood little chance against the icy parts. The trip: 10,6km, 530 vertical meters. Thursday; back in Ålesund, and like Tuesday, I had no idea where to go after work. But as I hadn’t been to Høgekubben yet this year, AND knowing that I could ski almost from the car at Vasstranda, that’s where I decided to go. It was the 3rd time this year that I skied up from Vasstranda. Karma was very happy, now quite familiar with this road. 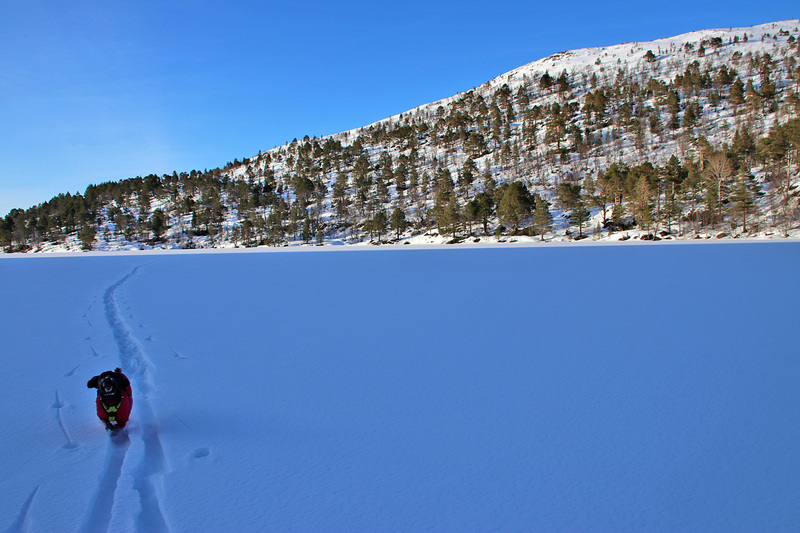 When we reached lake Langevatnet, I wasn’t sure how to approach Høgekubben – across the other side of the lake. 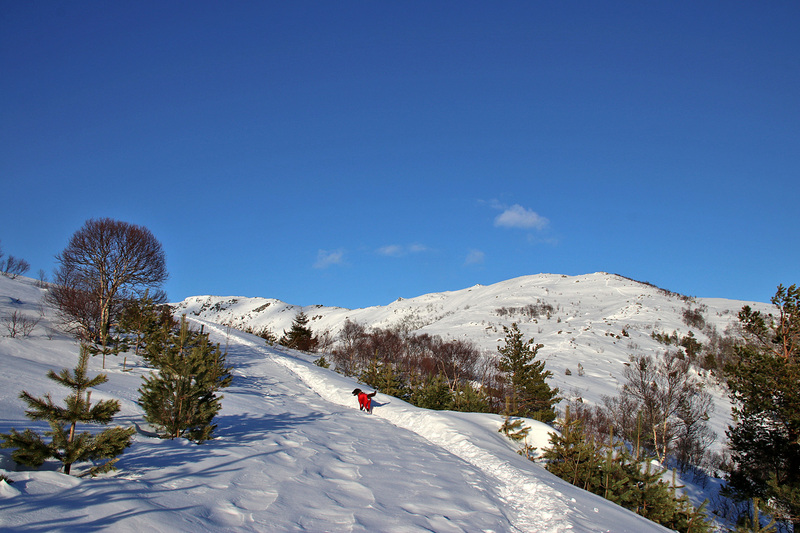 But in the end, I decided to ski around the lake (along the prepared ski track), coming up the ridge from the east. Halfway across the lake, I changed my mind and decided to cross the lake. There was not a SINGLE track on the entire lake. And given the fact that this is a regulated lake, I was a bit nervous. But I didn’t really feel that spring had come along just yet, and decided to take my chances. The crossing went fine. Karma had a hard ascent from the lake and up to the ridge, where walking got easier. The ridge was longer than I remembered it to be, but on the other hand, I hadn’t been up here in 10 years. The trip along the ridge was just DARN NICE, even though it was a bit windy. We reached the summit and I started looking down in the valley for prepared ski tracks, and spotted one. Great! Now, we both could get an easier transport back to the Vasstranda road. But first, we had to get off the ridge. I decided to continue along the ridge and a bit later, I could see prepared tracks from Emblemsætra. I took the skins off, and looked forward to 2 minutes with nice off-piste skiing before reaching the track. Then I lost one of the skis. It sailed down the ridge and stopped close to the track. I imagined I still could ski on one ski, and that illusion lasted 5 seconds, before I was buried in deep snow. 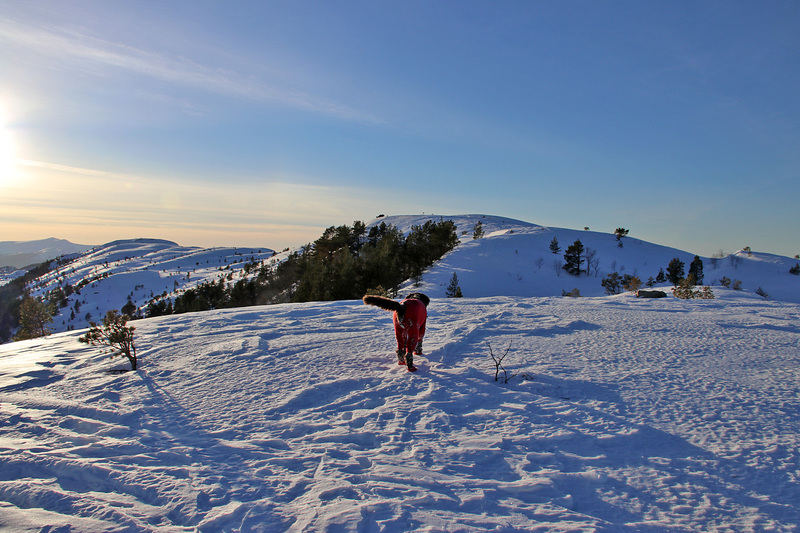 Once down on the track, now with both skis, a cross-country skier came up from Emblemssætra, took a look at my equipment and said “wow!”. I felt for explaining that I had been on the track for like … 30 seconds. Nevertheless, a mighty fine ski-trip, altogether. The trip: 9,1km, 530 vertical meters. Color effect in the sky. Halo? Saturday; another GORGEOUS day, no wind, and of course I had to work. From 7:30am to late in the evening, with a couple of hours free in the afternoon. Those hours were spent hiking Blåtind from Havåg. Anne joined me for a little while, but the plan was that she would find a sunny spot and enjoy life while I hiked Blåtind. I can only hope she can have her knee problem sorted out soon. I miss hiking with my girlfriend. The trip: 12km, 780 vertical meters.